Visit Name Change Kit, online at NameChangeKit.com, which is your online resource for when you need help with a personal name change application. 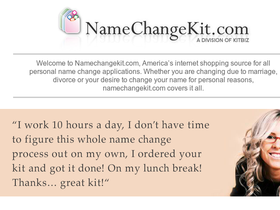 At NameChangeKit.com you can get low-priced and useful kits for name change applications, whether you are a newlywed, getting divorced, or simply want to change your name for personal reasons. Learn about the best ways to save at NameChangeKit.com with Name Change Kit promotions, Name Change Kit coupons, Name Change Kit discounts and Name Change Kit specials from 58Coupons.com. Are both you and your spouse-to-be changing your name? When both of you are changing your name you should get the Newlywed Name Change Kit from NameChangeKit.com to save yourself lots of work. Click link to enjoy this kit for only $29.95. For only $79.95 you can save yourself hours of work when dealing with a Legal Name Change. With the Legal Name Change Kit from NameChangeKit.com you will receive the necessary documents for your state to get the name change process rolling. Click link. When you need to change your name from Miss to Mrs visit NameChangeKit.com where you can get your printed mail Official New Bride Kit for only $28.95. Click link to get started. Save yourself some of the work of going through a divorce by getting the Divorce Name Change Kit, and get back your maiden name with less hassle. This kit is only $29.95 at NameChangeKit.com. Click link.